Jane Gogan must be a very happy woman right now. She’s sitting on the most popular Irish drama series in the history of television. As RTE’s head of drama, it was her call to commission Love/Hate, and it was her judgement that would have been in the firing line if it had turned out to be an embarrassing disaster. But her faith in writer Stuart Carolan, director David Caffrey and the cast has been repaid with spectacular interest in the four years since the first season, featuring Robert Sheehan and Aidan Gillen as the main stars and running to a modest four episodes, was aired. Love/Hate is truly a phenomenon. The audience figure for Sunday night’s blood-spattered season five finale was just over one million, and that’s without viewers watching on catch-up. Nothing other than The Late Late Toy Show, and latterly the Christmas specials of Mrs Brown’s Boys, can expect to chalk up numbers like that. The remarkable thing is that this is not the first time the series has hit the magic million mark. Gogan sounded suitably happy, as well as proud, when speaking on radio yesterday morning. She was even emboldened enough to quote House of Cards star Kevin Spacey’s address to the Edinburgh Television Festival, during which he said the days when any one series could expect to enjoy 30pc of the audience share were long gone. “We’ve well exceeded that now,” she said. More impressive even than the domestic viewing figures is the number of international sales Love/Hate has racked up. According to Gogan, “the format has been licensed at least once now in other territories”. 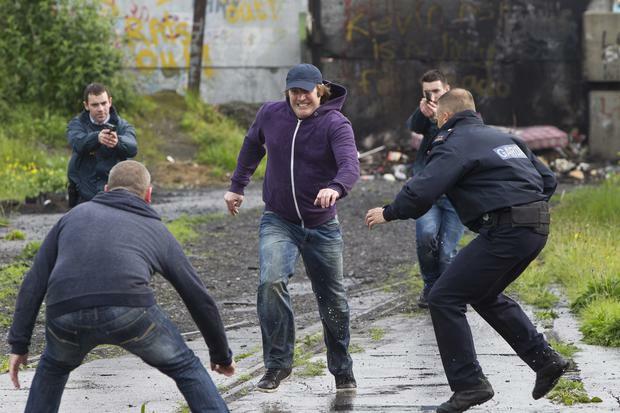 In spite of my reservations about Sunday’s finale (read Pat Stacey's review: Love/Hate: More a cliff drop than a cliffhanger) and the last two seasons as a whole, I’m genuinely delighted for everyone involved with Love/Hate that it’s been a runaway success. But you have to put that success into context. Love/Hate accounts for six hours of drama every year – not a hell of a lot when there are 52 weeks of airtime to fill. Take it out of the equation, which we have to until the inevitable sixth, and most likely final, season comes along next year, and what other than the much-anticipated mini-series Charlie is there to replace it? Yes, we have season two of The Fall for the next five Sundays, but that’s more BBC Northern Ireland’s baby than RTE’s, as was the dreary Quirke. Fair City and the occasional prestige BBC co-production aside, RTE’s drama output has been notoriously erratic and disjointed. A few offerings from the relatively recent past have stood out: Pure Mule and the stylish thriller Single-Handed, which was ultimately scuppered by lack of funding, are two examples that come to mind. The Clinic wasn’t really my cup of medical soap, but was nonetheless a smartly-produced Sunday night potboiler and very popular with the audience (which is obviously why RTE cancelled it). Restaurant drama RAW initially did a good job of capturing the buzz of Celtic Tiger Dublin but had worn out its welcome long before its fifth and final series. The odd high point aside, domestic television drama is probably in a worse state now than in the 1970s, when at least RTE broadcast single dramas by the likes of Eugene McCabe, Heno McGee and Ben Kiely. Or the 1980s, when it produced Strumpet City, which remains a landmark despite its production techniques looking terribly dated today. Given this chequered history, with more black squares than white, you couldn’t help but scoop up a large pinch of salt yesterday when Gogan said that “the investment RTE makes in drama is absolutely critical to what a public service broadcaster should do”. In many ways Love/Hate is a fluke, the kind of happy accident that occurs when creator and broacaster are in perfect harmony. When it’s at it best, which it hasn’t been lately, it’s superb. But, please, let’s not pretend that one success can obscure the fact that RTE still doesn’t have anything like a coherent drama policy. 'Thanks for the memories' says Nidge, but is that it?